With a goal of making as much as I can of my Christmas tree ornament and a “red and white” colour scheme I came up with some ornaments lately. I will be making more but here the ones I have so far. 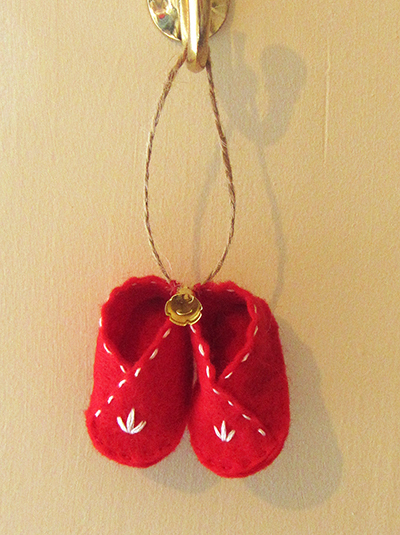 First up is a pair of mini felt shoes with some embroidery and a tiny bell. These are elves shoes. The pattern is a mix of several tutorials I found on the web reduced to look good on a tree. A good place to start is this great baby felt shoes project by the Purl Bee. 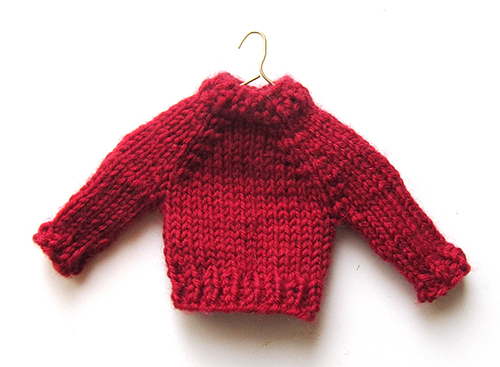 Now for the tiny sweater. I love those. There are plenty of patterns to choose from on Ravelry, the one I picked is the tee-tiny raglan pattern by Bird’s Eye View. I made some white and red of course but also a green one with a lovely cheesy Christmas tree on the front for a friend. Where this project gets really exciting is when it comes to the hangers. They are made with largish paper clips as explained here by Agus Yornet. I already have some more projects at the back of my head using this dream combo. Mittens say cosy winter like nothing else. 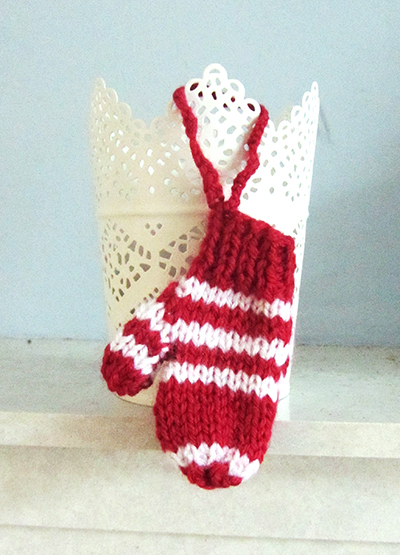 I made some mini mittens based on this Mitten Ornament pattern by Red Heart. They are really easy to make as they knit flat (no fiddly work in the round) and fairly quickly. 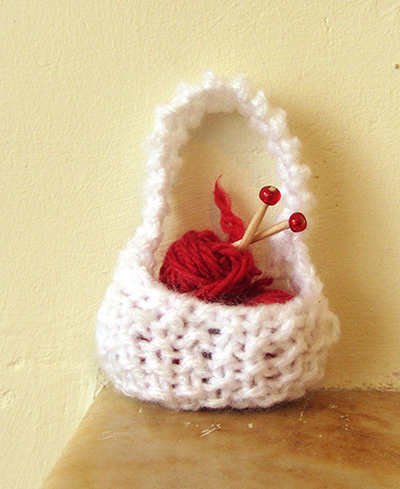 I couldn’t skip this yarn basket ornament also by Red Heart. I am not 100% happy with the basket but overall it works quite well. This is also a quick and easy project that would also make a great gift for a yarn craft lover. There are so much DIY ornaments tutorials out there. Mushrooms, ballerina mouse, teddy bear, santa hats, stars, you name it. I hope I’ll have time to make some more. What about you guys, have you been making your own ornaments this year? adorable elf shoes! I am making dala horse ornaments! Thanks Lee. Dala horses are really nice aren’t they. I saw on the web they come in so many colours and shapes!